SABER TIGER is a Japanese quintet that has built their reputation on playing an intense brand of technical power metal infused with doses of thrash and prog. They are led by guitarist (and sole continual member) Akihito Kinoshita. The other members are: Yasuharu Tanaka (Guitar), Yasuhiro Mizuno (Drums), Hibiki (Bass) and singer Takenori Shimoyama (who left the band in 2002, but returned in 2010). What separates SABER TIGER from their contemporaries are huge amounts of groove guitar and the fervent vocals of Shimoyama. Most Japanese bands I’ve listened to feature guitars that are dynamic and robust. SABER TIGER are no exception, as their guitar riffs and solos are uniquely frenetic and energetic. I have been a dabbler in the Japanese metal scene over the years, having been into bands like LOUDNESS, E-Z-O, ANTHEM and BOW WOW from time to time. SABER TIGER have actually been around as long as the influential, and certainly better known, LOUDNESS (both forming in 1981). SABER TIGER has had several demos, EPs and albums since the beginning, but their 1997 major label debut album, Project One, established the band and featured guest appearances by RON KEEL (KEEL/STEELER) and members of ANTHEM and LOUDNESS. SABER TIGER first caught my interest in 2011 with their masterpiece, Decisive. I couldn’t get enough of that release, and it’s definitely worth searching out. 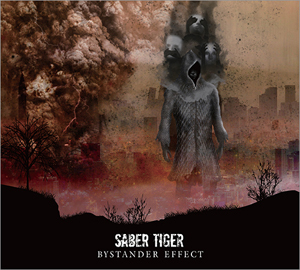 SABER TIGER’s latest release, Bystander Effect (first released in 2015) is the band’s eleventh studio album. It will soon get an international expanded edition release in 2018. The album begins with the machine gun blast of “Dying Breed”, marching out of the gates and into your ears. The serpentine riffs in this track are enough to make you dizzy. What an amazing performance by the entire band (especially Shimoyama) on this track. “Sin Eater” (video on KNAC.COM HERE) is a melodic maelstrom that features one of the best solos on the album. “Act Of Heroism” opens with a blazing riff and remains up-tempo throughout, while “Dreadout” pulses with a staccato attack and finds Shimoyama singing about his impassioned regrets due to his pride. The repetition of “Nobody knows!” in “One Last Time” makes it a fun track. There is another stellar solo on this song. The lyrical content of Bystander Effect is at times pretty deep. “Just World Hypothesis” is a good example, featuring some lyrics regarding poverty and inequality. “What I Used To Be” is another hard-driving melodic power metal track. “Shameless” is one of my favorite songs, mainly due to the fast tempo and cool backing vocals. Mizuno shows off on the drumkit with several tempo changes. The lone ballad is “An Endless End – Another Time”, which features an acoustic guitar intro and haunting vocals from Shimoyama. “Devastation Trail” is an instant classic track as far as I’m concerned. The lyrics are a scathing riposte to someone– I have no idea who, but they sound like they are their own worst enemy. “Afterglow” might be the most technical track on the album, and another favorite for sure. This is more than just a re-issue, as the band have re-recorded four tracks originally recorded in Japanese in English (all songs here are sung in English) as well as a new acoustic track called “Ship Of Theseus”, and a re-recording of the SABER TIGER classic “First Class Fool” from the 1998 album Brain Drain. Additionally, there are demo versions for “Sin Eater” and “What I Used To Be” included also, bringing the total number of tracks to 15. The total time of this album is nearly 80 minutes. You may be wondering, what does the title mean? The “bystander effect” is a psychological phenomenon in which individuals are less likely to offer help to a victim when other people are present. The greater the number of bystanders, the less likely it is that any one of them will help. If you’re interested in learning more, go to Wikipedia and read about Kitty Genovese, whose murder in 1964 gave rise to the term. Warning: it’s a pretty graphic and sad story. Bystander Effect is not your average Japanese metal album. It certainly stands among the elite in the realm of power metal. If you are looking for something different, do yourself a favor and check out SABER TIGER and Bystander Effect, available March 13th.